Willie Murphy’s squad travelled to Cooke Park in Tipperary on Saturday for the preliminary rounds of the competition and after unluckily losing out to Kilkenny (1-0) in the opening game, Wexford went on to beat Limerick County on a 2-1 scoreline with Jay Hogan and Player of the Tournament Lee Kennedy the marksmen. They then accounted for Tipperary 3-0 when Tim Ivers, Joe Finn and Cathal O’Brien scored and qualified for Sunday’s semi-final. 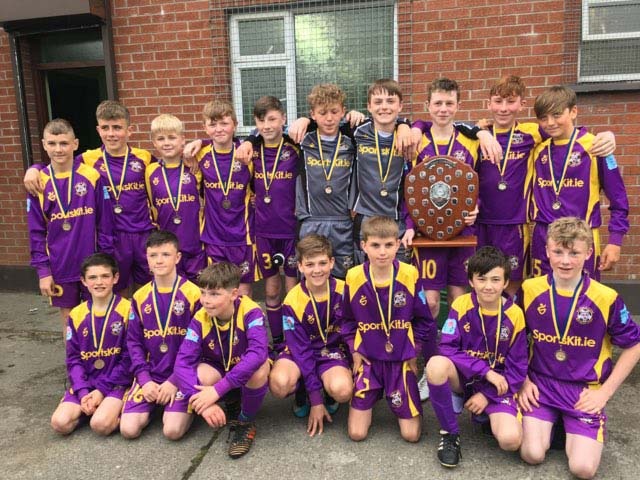 Wexford were in top form against Limerick District in the semi-final and ran out winners on a 1-0 scoreline with Lee Kennedy the marksman.They then faced a highly rated Kildare team in the final but two early goals by Bobby Katus put Wexford in control. Cathal O’Brien added another two with Kildare scoring their consolation goal from the penalty spot to leave the scoreline 4-1 in favour of the jubilant Slaneysiders. This was the 20th anniversary of the prestigious competition and the only other Wexford victory was in 2008 when Tommy Byrne was the team manager. All 17 Wexford squad members played their part in last weekend’s victory and congratulations go to all involved on their achievement.